Class V receiver hitch 2-1/2" receiver tube with Reducer sleeve 2.5" to 2"
Knapheide Drop Side Dump Bodies are the premier light duty dump bodies for class three to five chassis. Drop Side Dump Bodies from Knapheide are constructed of high-strength steel for unmatched durability and feature a crossmemberless understructure for low maintenance and rust prevention. Many industries including landscaping, lawn maintenance, construction and municipalities have come to rely on Knapheide Drop Side Dump Bodies to safely and efficiently haul and dump bulk materials. All Knapheide Dump Bodies, including Drop Side models, are fully immersed in Knapheide's electrodeposition prime paint system to ensure corrosion resistance and reliable service. 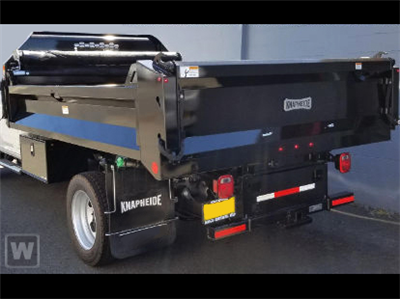 The next time you're in the market for a light duty dump body, look no further than Knapheide's Drop Side Dump Body.